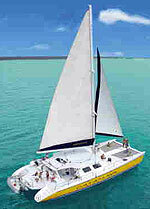 Charter this beautiful 65-foot catamaran for up to 100 guests in Playa del Carmen and the Riviera Maya. A private charter of this luxury catamaran is perfect for large wedding groups, family reunions, corporate retreats, or for large groups of any kind. Start your luxury catamaran cruise at 3:00 PM (3:30 PM in summer), and set sail for a beautiful coral reef, where you will snorkel with tropical fish and other marine life. If you don't want to snorkel, you can relax on the boat and enjoy cocktails from the unlimited open bar. Sun yourself on the front trampoline and soak up the rays. Then as the sun is about to set, enjoy a lobster or steak dinner cooked up on the grill (optional), or munch on snacks and watch the sun set from the turquoise waters of the Caribbean Sea. Round-trip transportation from your hotel is available at additional cost. Cruise Passengers: Transportation from the Playa del Carmen ferry pier (if coming from Cozumel) or the Calica cruise pier is available for between $6.00 and $10.00 per person, depending on the number of people you have. Duration: 4 hours approximately. You can use it for less time, but the price is the same. Departure: Meet at the Puerto Aventuras marina. Transportation from your Riviera Maya hotel is available for $6.00 to $10.00 per person (depending on the location of your hotel and number of people) upon request. Transportation from your Riviera Maya hotel is available for $6.00 to $15.00 per person (depending on the location of your hotel and number of people) upon request.